Just to simply understand the details given in attached file. Now we will determine the applicability of rate of of service tax as per Point of Taxation rule only (which is a new rule made by CBEC in 2011). Just for your knowledge : earlier we determine rate of tax basis Section 67 A which says 'Rate in force on date when service is actually provided or agreed to be provided' but we apply POT rule for determine rate of tax). POT means the "point of time when service deemed to be provided". 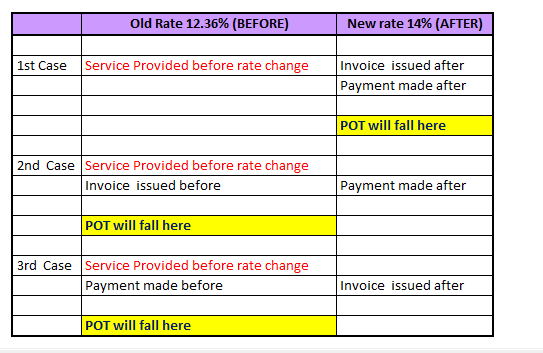 > Now we will determine the applicable rate in cases when "Service given before rate change "
> Determination of rate of tax in cases when " Service given after rate change "
( A short trick to determine applicable rate of rate (in cases where service provided after rate change) is where 2 things fall on one side... for eg. 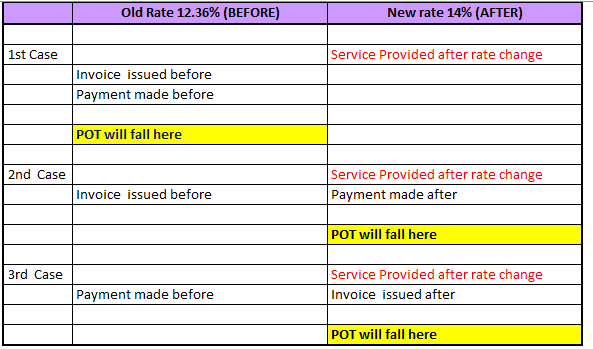 service provided after rate change and payment made after rate change fall on one side than 14 % will become applicable[see in 2nd case] ). Thanks to our moderator @ Amit Jolly for such nice article.